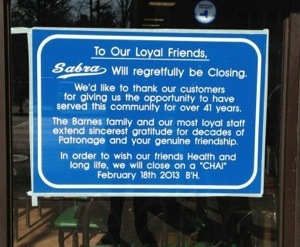 After 41 years serving the 5 Towns Jewish community on Central Ave (and thousands of HAFTR students), Sabra Pizza will be closing it’s doors on Feb 18th, 2013. Not long after Ruthie’s, next door, closed and became incorporated into the Sabra restaurant, the largest of the area’s kosher pizza shops will be gone. Remaining on Central Ave are other longstanding kosher pizza shops: David’s Famous, Jerusalem, and Shula’s. Having been a mainstay in the community for decades, please comment below with your thoughts and memories of Sabra.